Awhile back my sister-in-law sent me an email with several photos of people around the world surrounded by their stock of weekly groceries. I thought it was a fascinating observation. 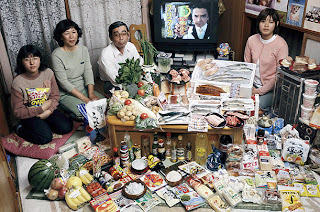 It made many differences apparent, like the amounts of processed foods or the amount of colors and textures offered (not to mention the abundance or lack of food in each family). I finally figured out where the pictures came from and wanted to share them. Time has a slide show of the photos which you can see. They are all from a book called Hungry Planet. I definitely want to get a copy for myself. Hope you enjoy it as much as I did!